I’m very excited to introduce ya’ll (that’s my Southern wannabe shining forth) to Christi Bennett! Christi and I have “crossed paths” a few times, but we didn’t get the chance to really get to know each other better until this year. I’m so glad we did! She has a refreshing, encouraging spirit that fits so perfectly into Mighty Mom’s mission to encourage and build up new parents. Besides writing articles, Christi is also an accomplished graphic designer. In fact, almost all the gorgeous blog post graphics you see in our latest posts are her original designs. I’m so thankful to have her on the team. Take a few minutes to get to know her better! Afterward, she moved back home and started her design career in the Chicago suburbs. As time passed, she moved further and further north, and landed in Wisconsin. Eric and Christi were married in 2012, after 3 years of friendship (ok, and after dating off and on and breaking each others’ hearts a couple times). They live in Wisconsin with their beautiful little girl and baby boy. Christi is a recovering “good girl.” She grew up believing that, the more she could “be good,” the more she would gain the acceptance of others and the acceptance of God. So she did her best to be teacher’s pet and a straight-A student. As it’s message sunk in she started to realize: Because Jesus was perfect on her behalf, and because he died to take on the punishment for her sin, she doesn’t have to hide behind a “good girl” façade! She can rest in His strength instead of trying to rely on hers. She’s learning to apply that very freeing news more and more each day. 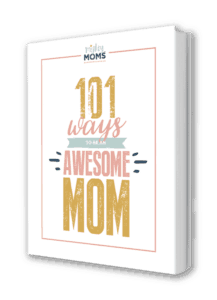 In addition to being a wife and stay-at-home mom, Christi writes for Mighty Moms, does freelance graphic design work, and manages her Etsy shop. She also enjoys photography, fine art, spending time with family and friends, being organized, chocolate, reading, and spending time outdoors. Click here to see a blogroll of all of Christi’s articles. Why Is Your Newborn Baby Crying? Here’s a Good Guess.